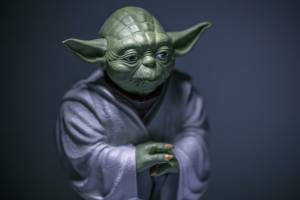 Marijuana Grow Equipment Wisdom, What Would Yoda Say? Our marijuana grow equipment should not be giving us average results. With too many growers, sadly, the status quo seems perfectly fine. They might say, “I get the same yield as everyone else and growth takes as long as it takes.” Average should only be a starting point and then we learn, we grow and we improve. Yoda input: Patience you must have, my young Padawan. We should always remember that we can tweak our indoor grow system for the better. The grow light systems in our marijuana growing kit are typically the source for average, so let’s see why. What is it about indoor grow systems, specifically hydroponic lighting, that is so challenging? How can we improve our indoor grow systems and grow equipment so that our yields improve? The solution to any marijuana grow equipment problems is almost always in the indoor grow light. It is important to use good quality indoor grow lights with enough wattage and quality grow light ppfd readings. Then we need to put those quality grow lamps on light movers. Yoda input: Do or do not. There is no try. Ok, so let’s see what “do not” looks like. Indoor marijuana growing systems under stationary grow lamps are the source of the yield challenge more times than not. Yes, you can get average results under a stationary grow lamp, but why do we want that? 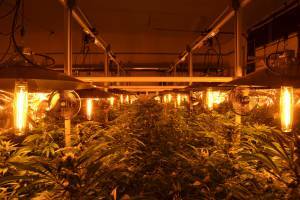 A stationary grow lamp, out of necessity, needs to be placed four or five feet or more above the plant canopy. That is an example of an Inverse Square Law “complication”. If the indoor grow lights were any closer, the plants directly under the grow lamps would suffer with hot spots. Stressed plants do not do well and they do not produce. Stationary hydroponic lighting also results in too many shadows within the middle and lower leaves. So with the stationary grow light setup, the indoor grow lights get positioned too high out of necessity. The problem with that indoor grow light placement, as we can see from the link, is that the hydroponic lighting intensity is greatly diminished the farther it needs to travel. Again, this is an example of Inverse Square Law. At 5 feet above the canopy, grow light systems are only 50% as powerful as they could be. The grow lamps of indoor marijuana growing systems placed at that kind of height will not result in the fast growth and maximum yield that we would want. Right there, we are average with just this one specific marijuana grow kit detail. This scientific fact is important to understand. Our indoor grow systems deserve better. Yoda input: Once you start down the stationary grow light path, forever will it dominate your destiny, consume you it will. Hey, we all know which path goes to the dark side here. Yoda input: Much to learn you still have, my old Padawan. This is just the beginning! If the indoor grow lights are moved on LightRail light movers, we will be able to change the height of the hydroponic lighting. This grow equipment change is huge in importance. If we drop each grow lamp of our grow light system several feet and then move this grow equipment on LightRail light movers, we get a better quality grow lamp to more area of each plant. Grow light systems moved on light movers as rail lights benefit more plant surfaces in the marijuana grow kit. And, this happens at just the right amount of time for each of those surfaces. This is called Leaf Area Index and, again, Yoda gets this. It is a very important detail to the success of indoor marijuana growing systems. Grow light systems that are fired in closer for maximum effect actually get maximum results, but only if they’re moving on a light rail system. Each grow light system, when moved, results in faster growth and substantially larger yields. There is no other way to achieve that kind of result and to such a degree. And, it’s the same result whether we use a LightRail 3.5 Kit, a LightRail 4.0 Kit or a LightRail 4.20 Kit. The point is to get a better quality indoor grow light closer and to get each of those indoor grow lights interacting with more of the leaves and at just the right amount of time. The best grow light systems achieve this by spreading out indoor plant light, with the grow lamps moving along LightRail light movers as rail lights. For grow light systems, the rail lights make for a more natural light source for the marijuana grow kit. By mimicking nature, it provides the type of light that plants can use. Yoda input: If no mistake have you made, yet losing you are….a different game you should play. Average is losing. Especially with the other exterior economic pressures we have today. Indoor marijuana growing systems do not have to leave us with average results. Instead, let’s do things differently. The simple grow equipment change of moving each grow lamp in our grow light system on a LightRail light mover as rail lights will give us faster growth and much better yields. Our marijuana grow equipment will benefit when we move those lights. A grow light system that can get closer for maximum PAR and ppfd while getting the correct intensity of light to more of the leaves will make all the difference for supercharged results. Marijuana grow equipment tweaked with this simple change will show that. Indoor grow systems using LightRail light movers take us from average to exceptional, with the fastest growth rates possible together with significant yield increases. It’s a smart business move. And, this marijuana grow equipment change will make an important difference for our grow setup. Yoda input: To be Jedi is to face the truth, and choose. Give off light, or darkness, Padawan. Be a candle, or the night. Editor’s note: As Yoda left our interview, we watched him walk away. He step into the elevator and then slowly turn towards us. As the elevator doors just began to close, he said very clearly, Move your light, Padawan.